Happy Exit for 2014 ~ Happy New Year 2015! 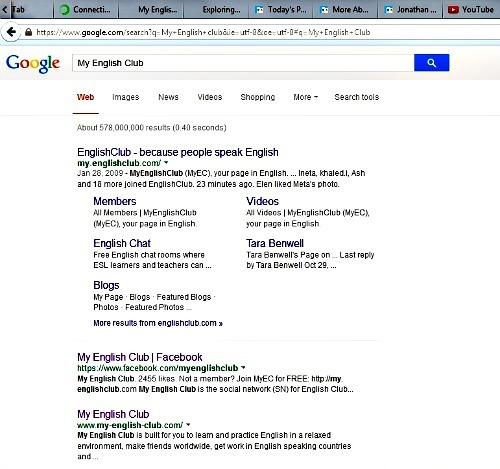 Let me share our good news with you: last night, just out of curiosity, I googled My English Club and I was so surprised to discover it came on THIRD place, out of “about 578,000,000 results”! Wow, that’s 578 MILLION websites! Having started to work on it exactly 2 years ago and in spite of the fact that during the past 16 months I could spend very little time on it, due to my highly demanding jobs, my dying father and my move from China to the Kingdom of Saudi Arabia, which was not easy, I assure you. We’ve considered vocabulary games for beginners and children in our last issue, but let us look at some vocabulary building exercises for more advanced students. 1. He’s a _____ smoker. No sooner has he stubbed out one cigarette than he lights another. 2. He said he had won it on the football pools, but we all knew it was _____ money. He’d been given it to make sure he wouldn’t go to the police. 3. Put the light on, somebody! It’s _____ dark in here! 4. I think I’ll go and lie down for a while; I’ve got a(n) _____ headache. 5. The runners crossed the finishing-line at the same time. It was a _____ heat. 6. He knew that once he had betrayed the I.R.A. he would be a _____ man. 7. At the meeting, the voting was five for and five against, which meant the chairman had the _____ vote. 8. He was so nervous about flying that he drank a large glass of whisky to give himself some _____ courage. 9. The robbery went off so smoothly that the police suspected it was a(n) _____ job. 10. This dress was _____ cheap. It only cost £15. 11. My grandmother can’t hear a thing. She’s _____ deaf. 12. Football has been a(n) _____ point with him ever since he was dropped from the team. 13. I don’t think Matthew will ever get married. He’s a(n) _____ bachelor. 14. They were bound to lose the election. It was a(n) _____ conclusion. 15. It’s no good coming to me for money, I’m _____ broke. 16. We had a(n) _____ shave the other day. A car almost hit us as we were crossing the road. 17. Her husband never lifts a finger in the house – he’s _____ idle. 18. It’s a(n) _____ secret that the new boss is gay. 19. He was so desperate to get home at the weekend to see his girlfriend that he decided to take _____ leave. 20. I’m not surprised he married Maria. He’s always had a(n) _____ spot for Italians. OK, my friends, and … just to keep the suspense level up high for the festive season, I’ll give you the answers in our next issue. Take your time and have fun with them in the meanwhile! Grammar ~ Grammar with Fun! Hoping you’re all having a great winter holiday, let’s also jazz the grammar part up a bit with some fun grammar games – would you like that? To start with, I’ll recommend a nice and easy game for the beginners. You need to choose the correct plural form of the given words, in order to help the twin sisters Pearl and Flora to find their friends in the bubble machine. Go to this site, if this game is for you. Then, for the intermediate students (beginners can try their hands at this game as well, mind), I found a really great one for practising the irregular verbs on this site: The Irregular Verbs Wheel . There are some things in English that can only really be learnt through practice. Irregular verbs are tricky and inconsistent - that’s why they’re called ’irregular’. You can practise conjugating irregular verbs by spinning the irregular verb wheel. Some are easy and some difficult, but how fast can you conjugate correctly? a) If the word underneath it is a synonym, then you have to decide which of the three phrasal verbs that follow is closest in meaning to the top word and click on that. b) If the word underneath it is an antonym, then you have to decide which of the three phrasal verbs that follow means the opposite. You get 5 points for a correct answer, and a bonus 10 points if you click the correct answer within 5 seconds. After that, we have Game 2 , in which version, you'll see a dictionary example containing a phrasal verb in the top box - but the particle (adverb or preposition at the end) is missing. You need to choose the correct particle from the four red boxes and click on it. To help you, the definition of the phrasal verb appears in black print above your four choices. You get 5 points for a correct answer and a bonus 10 points if you click the correct answer within 5 seconds. Well, I shall retrieve, with no further ado, to let you play in piece – I have my own games to play, you see. Your blueprint should be so clear and solid that the site can almost write itself! And your schedule should realistically enable you to execute the plan. When I started this website, in November 2012 - only two years ago, I made a conscious decision to follow this advice. 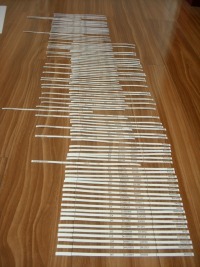 I selected the best 100 keywords out of my MKL and I cut them out in strips of paper, so I can visualise their connectivity and build my blueprint somewhere I could see it clearly, in order to conceptualise the relationships between those words and physically build a kind of a skeleton onto which I would add the flesh little by little, as my free time would realistically allow. From those humble beginnings, to scoring THIRD in Google out of 578 million websites, within 2 years took perseverance. If you are prepared to put that into a website and go through the CTPM, as I taught you in this course, you could reach this stage too. But until then, where do you start your own website’s blueprint? Your home page, of course! Because your Site Concept Keyword is one of your highest Demand keywords, you need to start from your home page, on TIER 1. Ultimately, it will be the most highly visited page. It won't be your first page to rank highly at the engines (it will likely be one of the last since it also has one of the highest Supply values among your Specific Keywords). TIER 2 pages are the critical hub pages between your home page (TIER 1) and your TIER 3 pages (usually the last effective tier). They logically flow/link into TIER 3 pages. High Demand and high CPC are nice bonuses. Why? These pages will, once your site matures, be found at the engines more frequently than TIER 3 pages. And since they are "navigation pages," visitors will click to visit them more often, too. So plan to monetize your TIER 2 pages, one way or another. Site structure (i.e., natural flow/linking to numerous TIER 3s) is most important. Humans must feel that you have sliced and diced a site in a logical, easy-to-understand manner. TIER 3 The mass of your content ultimately resides in TIER 3. Think of it as the big, solid foundation of your 3-TIER structure. If you have chosen your TIER 2s well, these keywords are easy to slot into place. How Big/Detailed Should Your Site Content Blueprint Be? Great question! The answer depends on you. How detailed do you like to plan? You only have to include the number of pages in your blueprint that you will have time to build during your first 6 months to 1 year. • If you organize your MKL into 7 TIER 2s, and then lay out 7 TIER 3s for each TIER 2, that's 49 TIER 3 pages all planned out. Together with the 7 TIER 2s and the home page, you have the blueprint for a 57-page site. • If you like to plan in more detail, map out 10 TIER 2s and, say, 10 TIER 3s per TIER 2. That's a 111-page site all planned out. • Finally, the "mega-plan." Place 15 keywords into TIER 2 and 15 more for each of them into TIER 3. That's 241 pages, more than enough to be getting on with! No, you do not have to write them all this week! Instead, make a schedule according to the time available for your site. Suppose you can only spend an hour or two per week on your site. A 50-page blueprint is fine because you will build 1 or 2 pages per week. Making a realistic schedule, and sticking to it, is one of the big keys to success, not just in SBI!, but in life. I haven’t started to monetize yet, but I have a plan for this. As we finish this lesson tonight, we’re going to start the chapter on investigating and planning monetizing ideas for our website-to-be. My plan is to follow the lessons contained in that chapter and give you practical examples applied to My English Club – in a sense, we are going to study this for real together. The complete process is the CTPM, if you remember, of which we’ve been concentrating on the CTP so far. For those of you who are not familiar with the CTPM, this stands for Content, Traffic, PREselling and Monetize, of which we talked in Issue 016 , back in September this year. A Very Happy New Year to you, my friends! Wishing lots of prosperity in 2015!